This pretty grid-based tangle pattern is from Canadian CZT Nancy Dawes and she calls it Da’Deal. Nancy is from Courtenay, a city on the east coast of Vancouver Island in British Columbia. 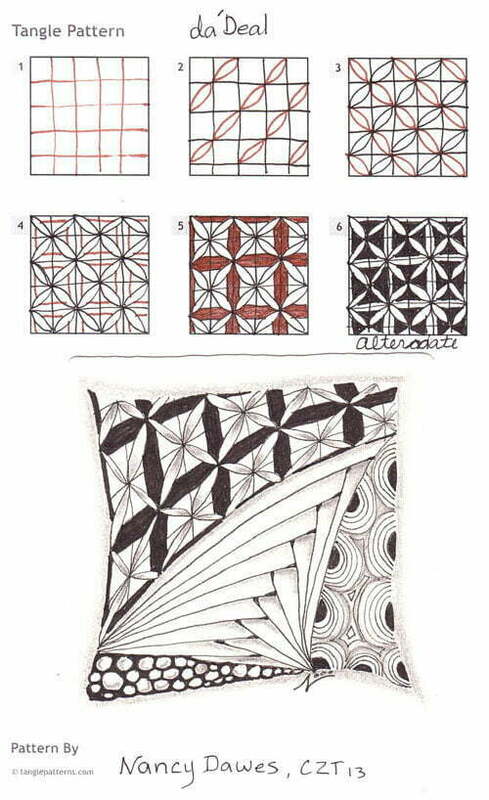 Here are Nancy’s steps for creating Da’Deal and a completed Zentangle® along with some official tangle patterns you may recognize. Check out the tag nancyd for more of Nancy’s patterns on TanglePatterns.com. This is a beautiful design. The alternate patterns are very nice as well. I love the way Nancy came up with the name of the pattern. Thank you for sharing! Oooo! I like this. A great grid pattern. I love the flower shapes and this fits in there beautifully. Thank you Nancy!